Please also see the print version of the 2012 Primary Election Voters Directory and Citizens Union’s press release regarding our 2012 Primary Election preferences. Excerpts from the print directory are available below. All questionnaires submitted to Citizens Union for contested primary elections are available; please note, however, that due to limited capacity, Citizens Union is not able to evaluate every race taking place in New York City. 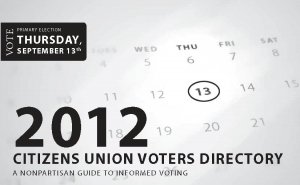 Citizens Union will evaluate Staten Island races in the General Election Voters Directory.